just back in from a great time visiting family in Michigan.. we thought we’d show Max snow ( he’s not seen it before ) but alas no snow in Michigan ;-( Well Max didn’t care…spending 99.9% of the time playing video games with his cousins. 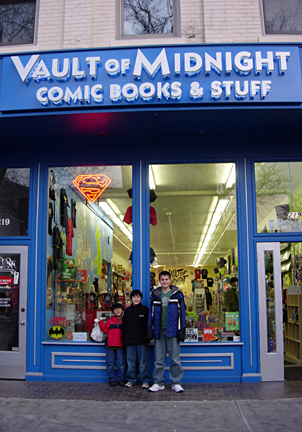 Come to think of it I hardly saw him the whole time… Once in awhile something happens in life that makes you stop and think “.. now thats weird !” One of those moments for me was visiting this comic shop in Ann Arbor called Vault of Midnight ( http://www.vaultofmidnight.com )… nice store with quite a lot of comics and toys… my nephew pulled me over to one of the toy sections and said did you see it ? I said what .He pointed and there on the wall was a Capt Maxx figure pinned to the wall (!) Now I know I sold them thru Diamond Comics .. but it was just bizarre seeing one of these figures way out here and in this very store … I had a out of the body experience.. at that moment my nephew said I’m gonna tell them you made that ! at which point I said NO ! in Horror… hey don’t want the attention ;-P … but still was neat to see a product I made in a random store. 2007 for me will be quite busy .. Sometimes I’m torn between blowing this company huge and just letting it be small.. but I’ve chosen to keep it small, one guy and do a few fun projects each year.. I’ll leave ruling the world of Japanese toys to others 😉 Things will kick into high gear in April, leading to Comic Con in July, big Japanese Toy show at Rotofugi than capping off the year with my Pasedena museum show in October. Anyways some cool toys coming down the pike soon, another book project, and a few more surprise cooking on the back burner.. here’s to a fun and happy 2007 !